Asked if it was OK to massacre civilians in wartime, You replied , no problem. And he didn’t stop there. You stated the decision it was the president’s decision alone. Wrong. Historians wrote about the positive glee that Harry Truman showed when he bombed Hiroshima thus opening the nuclear age. The latter according to IF Stone was a small man living in the shadow of the giant FDR. Now Truman has been rehabilitated among Americans. Now You is a law professor who probably won’t be dragged before any court for his shocking advice. 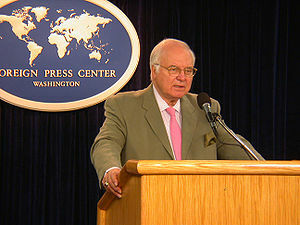 Worse that You are the theocons Michael Novak and George Weigel who went to Rome to convince the Vatican it was dead wrong to reject the slaughter in Iraq. The inhouse Republican theologians (Novak received $1.5 million from right wing think tanks) to the White House have never apologized for their enabling of the Iraq slaughter. After the invasion contrary to all international law, Cardinal Ratzinger stated the obvious: There were not sufficient reasons to invade Iraq. A million dead, 2 million refugees. In a desperate bid to grab small L liberal votes Stephen Harper has tried to position himself as overtly concerned with women and children, He is going to “mobilize” world leaders to save the lives of women and children around the world. “Canada will champion a major initiative to improve the health of women and children in the world’s poorest regions.” stephen harper, compassionate Conservative. NOT. This is as cynical an anoouncement as it gets, a pathetic attempt to poach a few votes from women (sho have little time for him) and swing voters who might vote for him. “Lewis emphasized, other nations have been on board what’s known as the Clinton Global Initiative for more than two years. In 2007, Norway and the Netherlands committed $1.2 billion to this. Last year, another $5.3 billion was kicked in from other sources.”It takes a lot of chutzpah to pretend that somehow you’re championing something that others have championed so vigorously before you,” Lewis said. But the announcement looks good. 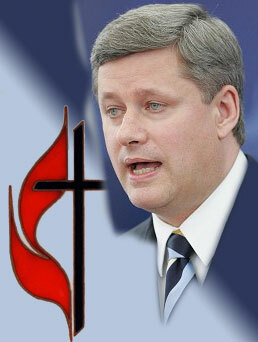 Maybe a few suckers will see Harper as concerned. His record in Canada is abysmal, slashing funding on Status of womewn by 43%, doing little for aboriginal women. If he weree really concerned he might take a little from his outrageous military spending. the federal Tories are pouring money into the military . The “Canada First Defence Strategy” (CFDS) will spend $490 billion over the next 20 years to transform its military so that it is “inter-operable” with the U.S. military. This chunk of change might be better diverted to our chintzy foreign aid and advocacy work on behalf of the poorest women. The late comedian George Carlin could never outrun his Catholic boyhood and his neurotic Irish Catholic mother. He never knew his father. A scarcely hidden emotional gap surfaced early.All this in George Carlin’s Last Words. Blessed with high intelligence, Carlin was educated in an open concept, no grades Catholic elementary school.The nuns were great. He quit his education at grade 9 and joined the air force at 17. He paid a heavy price for his deep alienation. 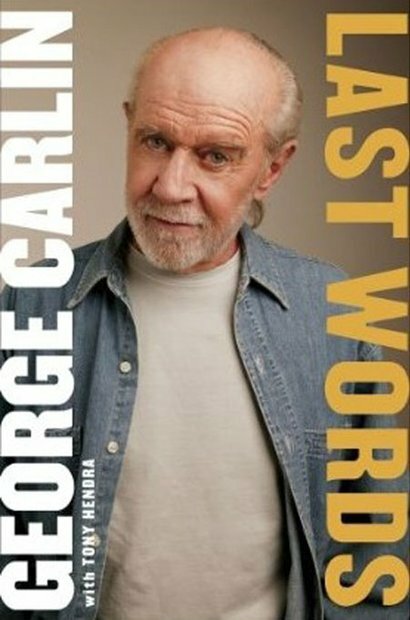 Almost a life long addict who drove his wife to drink and daughter to pot at age 10, Carlin finally licked his addiction in the last 10 years of his life. Like a lot of working class kids he had primal insticts, a good sense of right and wrong. But like a lot of rednecks with little education and hidden anger. his reading was shallow, As Keats would say, he did not drink deeply of the Pierian spring. He went on gut instinct and was often manipulated by the BS artists in the government propaganda dept. Then he got smart, started to read deeply and analyze political currents. Chomsky, Mother Jones, the Nation became de rigueur. It was round Ronald Reagan’s time that he started to lose hope in humanity, In his words,”I gave up on the species.” The election of Reagan, a real cipher if there ever was one, was “absurd. To this day it remains absurd.More than absurd, it was frightening.It represented the rise to supremacy of darkness, the ascendancy of ignorance.” So obviously a creation of the corporate class, Reagan did its bidding and enough of the poorly educated and politically naive, bought his avuncular crap.Thankfully, George’s death spared him the advent of Sarah Palin. The last time I saw George three years before he died, he was brilliant ripping into the shallow Reagan/Bush culture of excess with much ferocity. Sadly he had little to offer in refutation. No grand vision of peace, the common good, the dignity of humans and the earth. A deeper reading of authentic Cathiolic culrture could have helped him. Nonetheless the brother saw through much of the cultural crap. He did get the critical imagination but missed some of the sacramental. The Roman Catholic Archbishop of Utrecht has said he expects the fall in church attendance in the Netherlands to continue over the next decade. By 2020 only 10 percent of the Dutch population will belong to the Roman Catholic denomination, Archbishop Eijk told daily De Telegraaf. WELL THAT’S A BIT OF PLAIN SPEAKING FOR AN ARCHBISHOP. One of the consequences of the ongoing secularisation is that some 400 Catholic and 600 protestant churches will have to close in the next ten years, the archbishop said. Whatver happened to Holland you say? A CATHOLIC COUNTRY, VERY PROGRESSIVE IN THE 80S ( REMEMBER THE DUTCH CATECHISM) had every reason to hope for the birth of a new church.And they planned for it by instituting a country wide synod of all the faithful, something bishops are terrified of today. They know there is a huge gulf between them and the faithful. Undfer the great Cardinal Ajfrink they met, discusse and prayed for discernment and they came to a consensus, a real consensus fidelium: an end to celibacy and a move toward ordaining maried men and then…. 10% and sliding.So very sad and unnecssary.